﻿Lots of hands on adjustments, holding of the body, support with props, ayurvedic assessment tools and subtle body awareness for a truly healing and transformative experience. Get deep release of the tight spots in the pelvis, heart and skull, with a stabilization and realignment of of injured or hypermobile lumbar, neck, hips and shoulders. Specific therapeutic spinal release techniques are chosen according to the needs, tendencies, and experience level of the client. Deeply nurturing, restful, blissful, and healing on all levels. Yoga Therapy is great for beginners or experienced students who want to explore more opening. Kaya uses specific angles to reach into and release the muscles that attach to your spine, which has an impact on your whole body. This approach emphasizes "core release", beginning with the tailbone, into and through your sacrum, lumbar spine and psoas, and into your ribcage and neck. One yoga therapy session opens your body 6-10 times as much as a Deep Release yoga group class! *Prenatal Sessions Available! One Hour with specialized techniques for each part of the spine and extra attention paid to psoas release. Especially recommended for those who want deep healing and transformation that shows measurable progress from one session to the next. Also recommended for students who are unable to attend classes or to get reliable release with a home practice. An Shavāsana yoga therapy session includes blissful hands-on therapeutic adjustments for shoulders, hips, legs and neck in Shavasana (yoga's relaxation pose) with your legs comfortable elevated. Then, you continue to abide restfully and comfortably in Shavasana, while the therapist places her hands at the base of your spine to facilitate deep release throughout your spine and entire body. Clients experience deep relaxation and release as well as a number of possible benefits (listed below). A session is completed with a reclined spinal twist pose and a gentle massage up the length of the spine. The opening in one session is 6-10 times as much as you can get in a Deep Release group yoga class. *Prenatal Sessions Available! Personalized Yoga Sequence that you can do Anywhere, Anytime! Establish or deepen a home yoga practice according to your body and goals. You'll leave with a home practice "tool box" of notes and a simply structured laid out plan. More experienced students may leave with the means to create your own home lesson plans using basic principles of pose sequencing. This is an opportunity to ask your questions! *Prenatal Sessions Available and highly recommended. What can Ayurveda Give me? Ayurveda looks to discover and resolve the underlying cause of imbalance and illness. 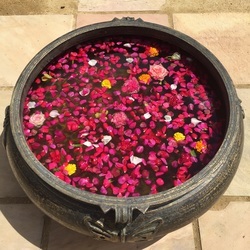 In my consultations I use several main techniques to assess and diagnose imbalance including observation, conversation, vedic astrology, hand analysis, pulse diagnosis. I also deeply trust your own inner wisdom and knowing and so we take to heart what your own heart tells you is the cause of your imbalance. As you become more balanced through ayurveda, you will come more and more in-tune with this inner knowing and we will utilize it more as we progress together. $175 for initial consultation; $90 for followups. Classes, workshops and sessions in Restorative Yoga Therapy, Yoga, Ayurveda, teacher Mentoring and Yoga Philosophy in the Bay Area (Emeryville), Northern California and by phone. With nearly 2,000 hours training in Svaroopa® Yoga, Kaya has also spent over a decade in deep formal study of classical Hatha Yoga, the Vedic Tradition, Ayurveda and Ayurvedic Yoga. Students attend Kaya's classes and sessions from Berkeley, San Francisco, Oakland and Marin.